Check out this year's winners at CDOGS! NSERC USRA Projects Available in Oceanography for Summer 2019. 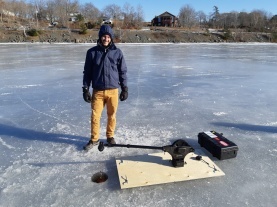 Current Tides show cases student research in oceanography at Dalhousie University. This world-class facility is the home to some of the world’s leading oceans researchers and projects. The Department of Oceanography offers an exciting interdisciplinary degree for undergrads eager to study and work in oceans. See what our students and faculty are up to! We are Canada's premier location for ocean research and education. Learn more about the department. Dalhousie attracts more than $100-million in research grants and awards annually. Learn more about research in the department.